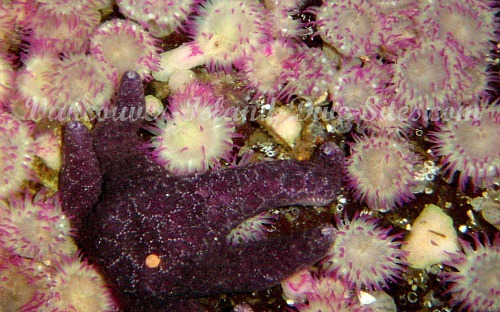 Gabriola Passage is a great dive location that can be accessed by either boat or shore, and no doubt is one of the best dive sites to visit in the Nanaimo, BC, Gabriola Island area. If you are doing this advanced level dive by boat you will likely launch from Nanaimo and head around to the opposite side of Gabriola Island where the Passage is located. If you are planning this dive as a shore dive you take the Gabriola Ferry from downtown Nanaimo, and upon arriving on Gabriola, driving to the opposite end of the island where Drumbeg Provincial park is located. When you arrive at Drumbeg Provincial Park, enter and take the right hand fork that you will find in the road, it will lead you to a parking area where you can access Drumbeg Bay itself. This is also a great picnic spot BTW! Gabriola Pass runs between Gabriola Island and Valdes Island, which will be to your right and around the point, (Josef Point) as you stand on the beach. So here is where the pre-dive planning is extremely important. First you need an up to date copy of the Canadian Tide and Current Tables, Juan de Fuca Straight and Straight of Georgia, volume 5. Follow the above link, select the correct year, select Current Tables, select Volume 5, select Gabriola Passage, then choose your day/s and time/s to dive here accordingly. What you are looking for is a day with little water exchange. "turn" (approximately 15 to 30 minutes) enter the water and position yourself out by the point on your right (Josef Point). So with the water on ebb, the direction will be from your left to your right, (east to west) ride the current into the passage until the current naturally stops, turns, and brings you back. To cool! As was mentioned previously, this dive as a shore dive requires some careful planning, but its worth it, and yes it can be done! It's also a great way to experience a drift dive without a boat! Speaking of which, watch out for boats! By the way, if your timing is a little off, you can easily get over to shore to wait a few extra minutes while the water slows! This is a high current area, and consequently the amount of marine life here is nothing short of amazing, but it is also potentially dangerous. Obviously if you do this dive from a live boat, it is a lot easier and much more straight forward, but just as amazing.